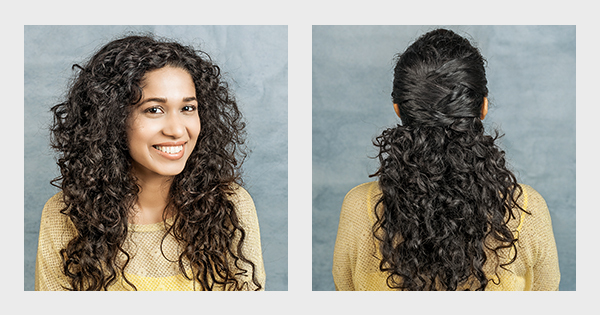 Perfect for medium-length curly hair, this half ponytail hairstyle will help you face days when your hair just won’t behave. This zig zag ponytail hairstyle looks classy in the front, while it’s a party in the back. Follow these steps for minimal effort and maximum reward. Step 1. Pick up a section of hair on the top of your head and tease it. Step 2.Separate a section of hair from above your left eyebrow. Step 3. Bring it to the back of the head (diagonally across) and pin it. Step 4. Repeat this on the right side, crossing it over the previously pinned section. Step 5. Pick up a section on the left side, below the previous section and bringing it to the back of the head, pin it below the previously pinned section. Step 6. Repeat Step 5 on the right side, pinning it below a previously pinned section. Your zig zag ponytail hairstyle is ready to roll with formal clothes or a summery dress.